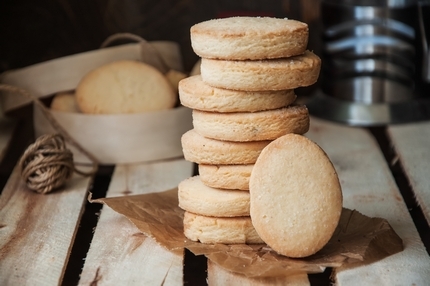 Traditional Scottish shortbread recipe that is best eaten with a wee dram! Eating in by Sue Lawrence reveals a tip given to her by Aggie MacKenzie's mum Joan which is to not roll out the dough to fill the tin completely but to allow it to be just a little bit shy of the edges. This allows the dough to move out during baking and to fill the tin and cook evenly. 1. Cream the butter and sugar until almost white and gradually add the flour. 2. Squeeze the whole mixture into a large ball. 3. Remove from the bowl and dust in ground rice. 4. Press into an 8inch square tin and smooth and make pinpricks all over. 5. Bake in the oven at 160c, 325f or gas mark 3 for 25 minutes. 5. Remove, dust with caster sugar and cut into 12 fingers or into round shapes. 6. Cool for 15 minutes in the tin. 7. Place on a rack until cold and store in an airtight tin. Maw Broon's But An' Ben Cookbook has some of the history and traditions surrounding it such as a cake of shortbread being broken over a bride's head as she steps over the threshold of her new home. This is done for luck and if it breaks into small pieces it is said that her marriage will be fruitful. To accompany her cookbook Maw Broon has an apron that makes an ideal gift for any cook and comes with a free shortbread recipe. Buy Now. 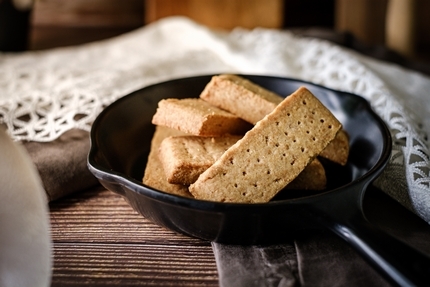 Maw Broon's Cookbook has another traditional shortbread recipe which suggests substituting some of the plain flour for semolina to make it crunchier. One of the most delicious shortbread biscuits that we have tasted in a Scottish restaurant was at the Three Chimneys on the Isle of Skye. It was served warmly baked with Cranachan. 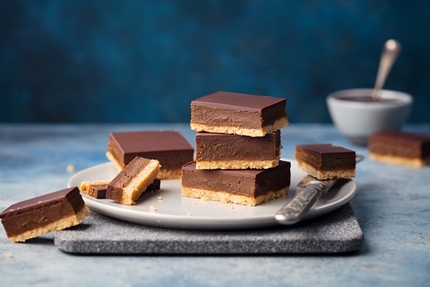 Millionaire's Shortbread is a delicious Scottish biscuit of one layer of chocolate, then caramel and then a base of shortbread biscuit. 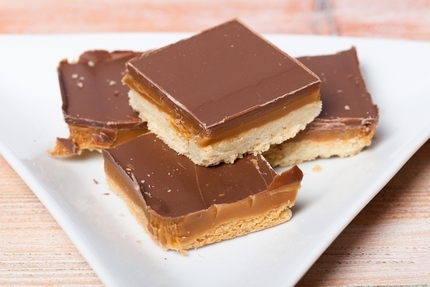 A recipe for Millionaire's Shortbread can be found in Taste Ye Back: Great Scots and the Food That Made Them. The Cookiepedia has a range of cookies and biscuits which includes a shortbread recipe which can be cut into wedges, rounds or bars with instructions to cut it into other shapes like coins, diamonds, shards and dominos. Alternatives include an espresso and lavender lemon shortbread.